Note: The story originally appeared in the Arcata Eye on April 3, 2007 – Ed. Ingrid Hart's iconic Humboldt Honey poster. 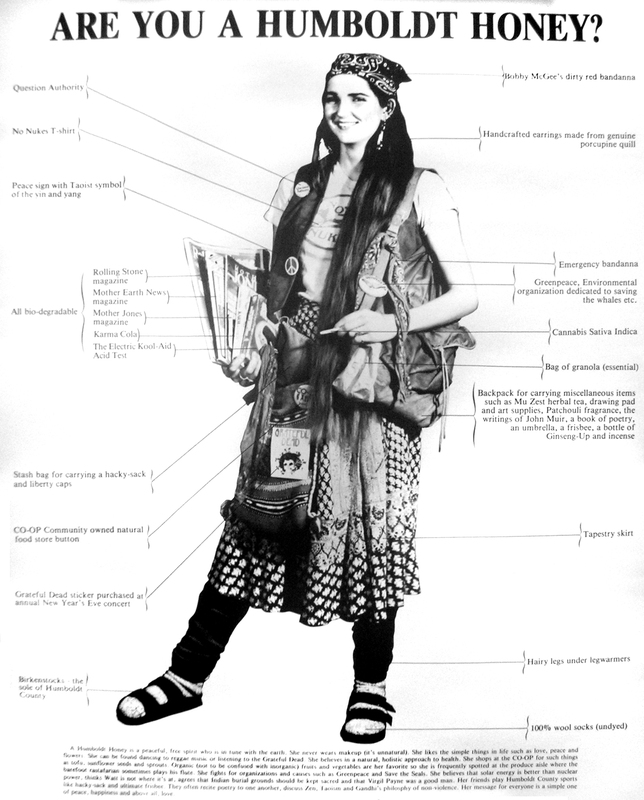 ARCATA – You’ve seen her on the Plaza, at Co-op or HSU – the flower of Humboldt womanhood, festooned with any number of countercultural cues – calculatedly proletarian garb, buttons espousing causes sweet and snarky, a sage smudge or patchouli aroma and a faraway look in the eye. Nowhere is the stereotype more completely expressed than in the legendary “Are You A Humboldt Honey?” poster that most everyone has owned and lost sometime during house moves. The poster depicts what must surely be the mother of all Honeys, bedecked – maybe laden is a better term – with every possible hipster accessory, aglow with cool confidence and fully armed to do battle with the dominant paradigm. The timeless poster was born in 1983, and over the intervening decades has spawned spiritual spinoffs – a modern-day calendar, a “Humboldt Hunk” poster and, inevitably, a particularly potent breed of cannabis. Still another by-product was the furor that erupted around the image at the time of its release. For Humboldt Honey poster creator Ingrid Hart (then Ingrid da Silva), the poster that began as a lark has been something of a life-changer. Hart, then a 21-year-old HSU journalism student, had noticed the then-popular “Are you a Valley Girl?” and “Are you a nerd?” posters, and decided that Humboldt’s homegrown stereotype was suitable for the same treatment. Her motives were included celebration of “the Humboldt look,” but also to make a few bucks to help pay her tuition. The systematic way she went about it, though, was decidedly more nerd than Val. First, with help from her roommates, Hart brainstormed Humboldt Honey hallmarks: the Birkenstock sandals, joint, peace button, bandana and other essentials. “It was a fun process,” she recalls. A proof-of-concept photo shoot followed, complete with a signed model release from roommate Elida Gonzales. Convinced of the project’s worthiness, Hart then went out in search of the ideal Humboldt Honey at that most fertile ground for countercultural candidates, the Arcata Co-op. “I wanted a woman with really long hair,” Hart said. Standing around out front of the old quonset hut store on I Street, she scanned the passing crowd for possibilities until, after just 10 minutes, espied a likely suspect – a young woman with the requisite tresses and general form factor. She approached the girl, described the concept and popped the big question. The larval Honey was Leoni Nicol. 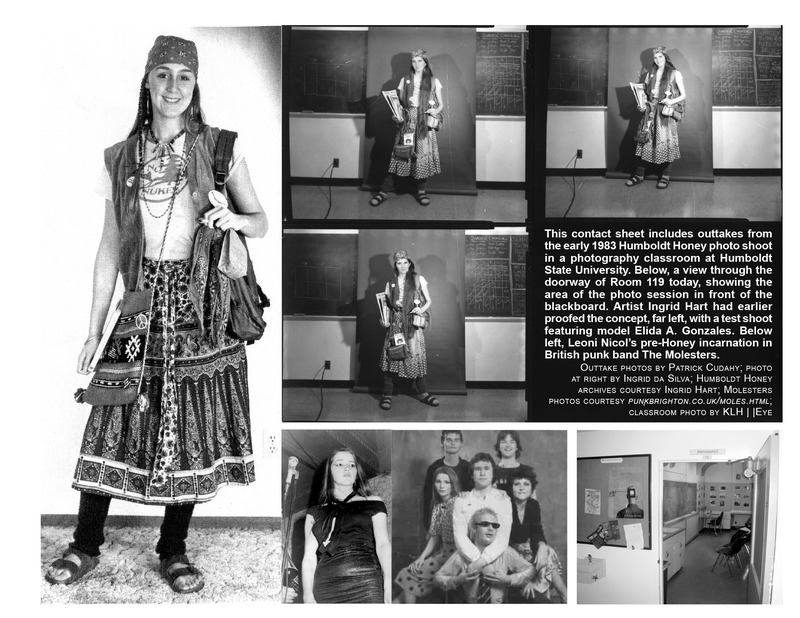 Besides the fact that she wasn’t dressed in anything like the hippie garb Hart would later adorn her with, the way she Nicol spoke immediately gave away the fact that she was anything but a homegrown Humboldter. “She had a thick Scottish accent,” Hart recalls. Nicol was a Scot, a world traveler passing through Arcata as so many young adventurers do. She was also comfortable being in the limelight and assuming different personas, having performed as a rock singer off and on for years. Some five years earlier, Nicol had been part of a British punk band known as The Molesters. The band’s single, “Commuter Man,” can be heard online at rhapsody.com/themolesters. Uncannily, with its jangling guitars and Nicol’s vocals, the song is eerily reminiscent of the San Francisco, Jefferson Airplainesque sound well-matched to her later incarnation as a ’60s-ish Humboldt Honey. With her model secured, Hart enlisted the services of up-and-coming local photographer Patrick Cudahy. As fun as the project was, Hart was serious about quality of the end product. He, Hart and Nicol gathered for the session in Room 119 of the Art Building at HSU. The room still serves as a photography classroom. Over the course of three or four hours, using an Omega camera which made four-by-five inch negatives, Cudahy and Hart shot Nicol in several poses, trying to capture the quintessential Honeyhood. Settling on a shot from the eight or 10 they took that fateful day, Hart then did the layout manually in her apartment at the Colony Inn. With desktop publishing still a few years off, Hart hired Pioneer Graphics to do the typesetting and had the posters printed in Santa Rosa. Her first press run wrought 1,000 copies. The young entrepreneur placed the posters in 15 or so boutique shops around Humboldt with a student-affordable retail price of $3 each. With that, the Humboldt Honey had been released into the wild. Little did Hart know that her beaming, bling-bedecked beacon of Humboldt hipness would uncork a culture-clash of headline-grabbing proportions. The posters sold well. Buyers sometimes snapped up multiple copies to send to friends and relatives back home as a visual aid to understanding Humboldt’s alternative culture. But as much as some loved Hart’s Humboldt Honey, others hated it. In an April 17, 1983 front-page story in the Times-Standard, Hart explained that she wasn’t the Humboldt Honey type herself, and that the poster was intended as equal parts satire and tribute. The story only further infuriated skeptics. T-S Managing Editor Jerry Post told the HSU Lumberjack that some even objected to it being on the front page of the Sunday edition. A flood of letters to the editors of local newspapers ensued, decrying the presumed celebration of slovenliness, drug-taking, rebellion and general hippiehood. Though the smiling Nicol is fairly meticulously garbed, clearly literate with her array of magazines and obviously has some means to support her lifestyle choices, traditionalists perceived the hapless Honey as a dour denizen of the dumpster. Mrs. L. Neustrom of McKinleyville described local high school and college girls as “a bunch of rag-a-muffins,” and hoped that young ladies would again try to appear lady-like. “Back in my day, it would have been difficult to attract a young man looking like that,” wrote Mrs. Neustrom. Some people – including young men – got it, though. 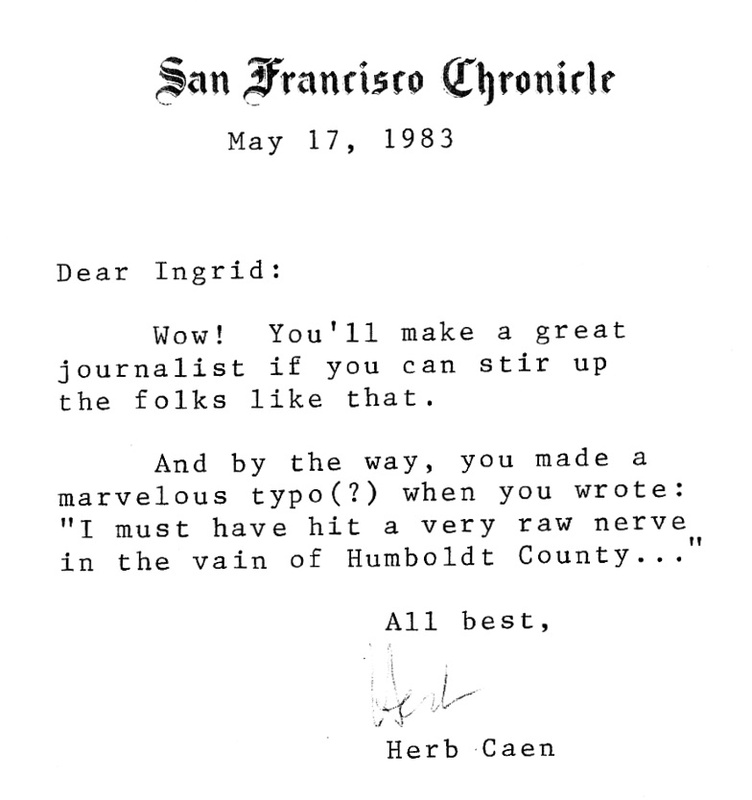 But one of the most affirming votes of confidence came from San Francisco Chronicle columnist Herb Caen, who applauded Hart’s knack for exciting public opinion. “You’ll make a great journalist if you can stir up the folks like that,” Caen wrote. By June, Hart was moved to tell her side of the story. In a “View from the Stump” in the Lumberjack, she observed that she had “stirred up a very live hornet’s nest” that unleashed pent-up animosity toward Honeys and their ilk. Hart said that she’d had to change her phone number, but that the poster had accomplished its intended purpose. “My financial independence from the parental unit has been established – for now,” she wrote. That being the case, she refused to diversify the line with T-shirts, postcards and bumper stickers as some had suggested. She even refused to make more posters. “I could probably sell more but I have made all the money I need,” she said. It’s fair to surmise that Hart’s capitalism-be-damned lack of a craven profit motive might have only further confounded her critics. Others have recognized the timeless image’s equally perpetual profitability. A reproduction – with Hart’s attribution removed – still sells steadily for $7.99 each at Eureka’s Picky Picky Picky store. “We’ve had it forever,” said owner Dan Ricke. “People like ’em still.” He said he didn’t know how the store came to be the sole remaining franchise, as he’s still selling off copies obtained by the store’s previous owner. And the poster still sells “ a couple a month” for the same reasons. “I do get people that like to send ’em to friends,” Ricke said. As for the Humboldt Honey herself, Leoni Nicol, her present whereabouts are unknown. Efforts to reach her for this story through a friend of a one-time friend were unsuccessful. “It was good for a drink or two later,” Cudahy muses. Still, she seems little changed in terms of attitude since the heady days when her Honey held Humboldt’s attention. This entry was posted on Thursday, July 8th, 2010 at 2:04 pm	and is filed under Community. You can follow any responses to this entry through the RSS 2.0 feed.